Joan, Merry Christmas to you! I love this card - simple and elegant! So beautiful!! Merry Christmas Joan! this is lovely...merry christmas eve! Merry Christmas Joan! Such a beautiful card! Love the gold foil - I had never thought about cutting that. This is just beautiful. Love the clean simple and elegant style of it. Merry Christmas Joan! My favorite Christmas card this year. Thanks for inspiration, and entertainment when you let loose with your great writing gene. Merry and Bright 2014 to you! Merry Christmas Joan - I absolutely adore your blog and don't take time to comment often enough. Thanks for putting you and your work "out there in the universe". I adore your card. 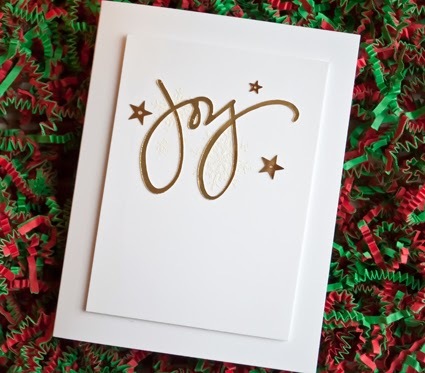 For the first time, I am picking a word for the year, and Joy is my word for 2014, which makes me appreciate this card even more. I hope your holidays are full of blessings. 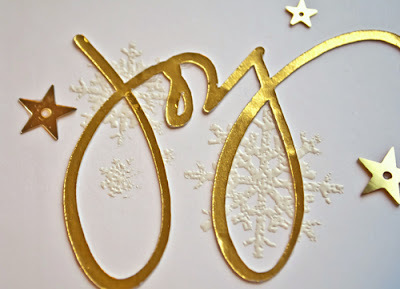 A lovely card; the gold paper is perfect. Merry Christmas to you and your family.